Aggregators play a major role in library e-book spending decisions today. This is largely due to the broad selection, access models and workflow solutions we are able to provide. 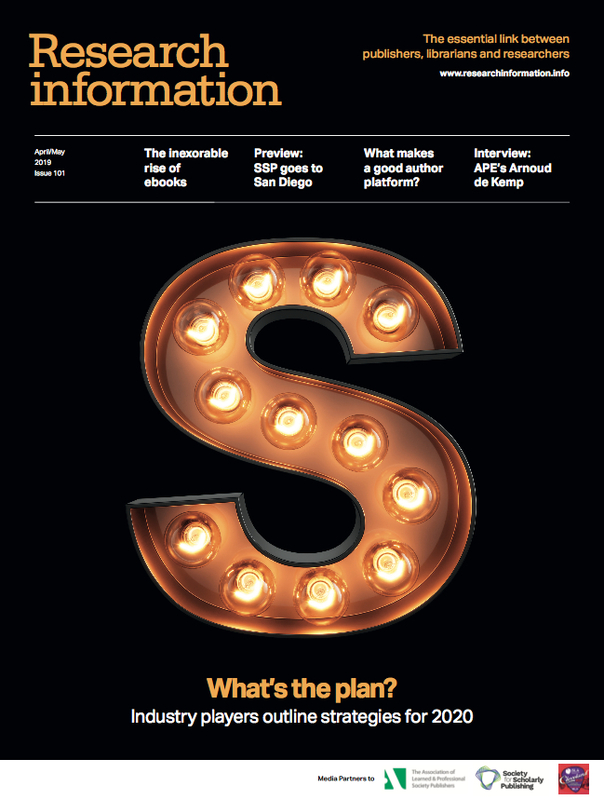 As processes and workflows around e-books are still forming, aggregators offer time and cost savings by standardising workflows, integrating with various ILS suppliers and enabling libraries to acquire a broad selection of titles, from thousands of publishers, with a common acquisition and management workflow and interface. Aggregators also offer libraries a great range of choices with different access models available for different subsets of content – whether subscription, upfront purchase or demand-driven acquisition (DDA). 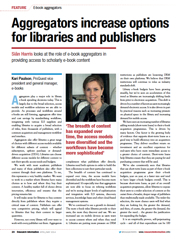 Libraries can choose different access models for different content to suit their specific access needs and budgets. We work with most academic publishers and many of these publishers also offer their content through their own platforms. To me, this represents a very healthy market. We want to work in a market where libraries have many choices as to how and where they buy their content. A healthy market full of choice drives innovation, efficiency and ensures that the pricing remains fair. It will make sense for libraries to buy content directly from publishers where they require a critical mass of content. Publishers can offer very competitive pricing, which will appeal to libraries that buy their content in larger quantities. However, not every library will ever want to work with every publisher out there. Aggregators complement what publishers offer directly. Libraries need both options in order to build the best collections to suit their particular needs. The breadth of content has continued to expand over time, the access models have diversified and the workflows have become more sophisticated. It’s especially true that aggregators are now able to focus on refining workflows and we’re seeing deeper levels of sophistication and integration with ILS systems, discovery services, knowledge bases and other cloud-based management systems. We’ve continued to see a growth in demand. The more e-book titles libraries provide to their users, the more they discover and use. We see increased use on mobile devices as users want to access content where and when they need it. Libraries are putting more pressure on DRM restrictions as publishers are loosening DRM on their own platforms. We believe that DRM restrictions will continue to relax as industry standards shift. Library e-book budgets have been growing steadily, but we’ve seen an acceleration of this trend as libraries are increasingly shifting funds from print to electronic acquisition. This shift is driven by a number of factors as users increasingly demand electronic access. It is also driven in part by practical reasons such as increasing pressure on physical space in the library and increasing demand for mobile access. We have seen an increasing number of libraries adding rentals (short-term loans) to their e-book acquisition programmes. This is driven by many factors. One factor is the growing body of evidence that supports short-term loans as a good way to build efficiency into an acquisition programme. They deliver excellent return on investment and an excellent experience for end-users who have more immediate access to a greater choice of content. Short-term loans help libraries ensure that they are paying for and purchasing content that will be used. We’ve also consistently seen that libraries that use short-term loans as part of their e-book acquisition programme grow their e-book budgets, year on year, at a faster rate and tend to have larger e-book budgets overall. This is because short-term loans, as part of an overall acquisition programme, allow libraries to expose their users to a wider selection of content at the outset from a broader, deeper range of publishers than traditionally made available. The wider the selection, the more chance users will find what they are looking for, the greater the demand, and then, of course, the greater the demand, the greater the need… the greater the justification for expanding the budget. It is an empirically proven, self-perpetuating cycle – and all of that expenditure can be 100 per cent justified by use. We have libraries in Australia that are in their eighth year of using short-term loans as part of their DDA programmes, demonstrating the long-term sustainability of the model, and providing excellent statistics over time. DDA or PDA plays a significant role in e-book acquisition. It’s been a major driver in e-book adoption in libraries and has really helped fuel the transition of print books to e-books. It has helped bring books back into the mix with e-journals. The beauty of DDA is the breadth of choice it offers; providing a critical mass and demonstrating the real demand for books generally. It has brought a lot of efficiency to both the acquisition process for libraries and access for the end-users. The model has boosted the discoverability of book content for all content from all publishers. It has, to a good degree, democratised discovery and increased usage for many publishers and their authors who may previously have been excluded. For all of these reasons, I believe it’s played a very important role to date as we are transitioning from print books to e-books. How this model plays out over time remains to be seen – but, as with any market, the models and pricing mature in line with the market and within the influences of the wider environment. The model has been moderately disruptive to the traditional acquisition model and workflows for the better as e-book adoption and usage matures. As we see the effects of the model on the full supply chain over time – from publishers to end users – I expect we’ll see the model evolve; exactly how remains to be seen. Aggregators will continue to build in efficiencies and value around the acquisition of and the access to e-books. For users, this will include the continued innovation around access but also around scholarly sharing and collaboration. For libraries, we will continue to refine workflows and discovery making it easier for libraries to acquire, manage and assess their e-book collections. We have a growing body of data around e-book usage and we will soon be able to harvest this usage in increasingly meaningful ways, providing progressively useful recommendations to libraries and the end-users alike. Library book budgets have been under pressure for years, and the portion of those budgets earmarked for e-books, which grew slowly for years, recently has grown much more rapidly. We are seeing a demand for e-books in virtually every subject area, although it’s no surprise that demand is highest in areas like business, science, and technology. Ingram Content Group has aggregated more than half a million titles for the library community from more than 900 publishers on our MyiLibrary platform, one of the leading e-book platforms used by libraries today. From those titles, it’s not unusual for libraries to purchase from hundreds of different publishers in a given year. If we had not gathered a comprehensive selection of titles from a wide range of publishers on a single platform, libraries and their readers would need to navigate possibly hundreds of different interfaces, understand varying business policies, and devise multiple workflows to purchase the same set of titles; that’s a lot of time and effort. We doubt libraries would be able to offer patrons the range of titles they can today without help from aggregators. There are more e-book aggregators today than there were in 2004 when MyiLibrary launched, and competition among them is vigorous. In some cases, aggregators are competing, but are also collaborating at the same time, as Ingram does today with both EBSCO and EBL, two e-book aggregators whose titles we now offer with MyiLibrary titles on our OASIS content platform for academic libraries. MyiLibrary e-book titles were already “aggregated,” so to speak, with their print counterparts on OASIS, along with a comprehensive selection of all the print books a library might need. While the importance of e-books to academic libraries has grown since 2004, print books also remain important. Making possible a single library selection and acquisitions routine for print and e-books together is a powerful proposition, even more so with several aggregators offered on the same interface. It’s obvious that the importance of e-books has grown for libraries. However, it’s been the library workflows enabled by aggregators that have really fuelled that growth. This is a major advantage e-book aggregators have over standalone publisher platforms. Libraries and their patrons want access to e-books at all times, for online viewing and for downloading, with as little interference as possible from the DRM mechanisms publishers require from aggregators. DRM protects content for publishers, but also drives libraries toward their own platforms, where DRM is usually more relaxed. That’s an advantage that publisher platforms hold over aggregators, control over when and where DRM is imposed. Ingram offers purchase models to libraries through our MyiLibrary platform, and does not currently offer rental or short-term loan models. We are aware, of course, that the models are popular among libraries. We’re aware, too, that publishers at the moment are reviewing the terms of these arrangements, which have been very favourable to libraries to date, and will likely encourage more purchasing under revised terms. Patron-driven acquisition (PDA) or demand-driven acquisition (DDA), where purchases or loans are triggered by actual patron use and not by traditional selection, is a significant force among academic libraries. The idea of patron selection started small, has been growing for years and currently rests between the late stages of experimentation and the early stages of institutionalisation. The balance between those two stages varies a great deal by library, but today it is not unusual for some large libraries to devote a high percentage of their book budget toward PDA. With budgets under such pressure, speculative buying, in case there will be usage, is a harder case to make than purchasing based on actual usage. Consortial PDA plans, where members of a group pool funding and provide access to a selected group of titles and share ownership of the resulting purchases, is a growing sub-trend. The rise of e-books enabled PDA arrangements to spread, since the mechanics were straightforward and patrons had instant access to the book they wanted. While the mechanics are less straightforward and patron access is not instant, PDA arrangements for print books are growing too, although are much less widespread. We expect PDA to continue to grow, and believe that this method of acquiring e-books will co-exist with more traditional methods. On the publisher side, working with content aggregators expands content reach. Publisher resources are best spent creating new content, not setting up e-book accounts, uploading metadata or managing DRM. Working with a solid aggregator, publishers can connect content with hundreds of libraries worldwide, with one point of entry. Ingram works closely with publishers, and contracts with each one that offers titles on our platforms, so business terms on the financial, technical, marketing, and DRM side of things are established and maintained. Although this is now more the exception than the rule, occasionally publishers are wary of working with aggregators, so a publisher might become the object of a sales effort, which is nearly the opposite of their traditional stance with booksellers. Aggregation has been a powerful force in the growth of e-books among academic libraries, and we see no sign of this changing. There is no doubt that a demand for e-books from many hundreds of different publishers through a variety of workflow, selection, access, and purchasing arrangements will continue to be needed. It’s not hard, in fact, to see the aggregator role expanding, by growing their title offerings well beyond English, or by getting more involved in online non-book formats, or by helping to organise the growing phenomenon of self-publishing, just three examples of possible new roles. Budgets continue to be under pressure at most research libraries. Librarians want to choose books that will be used by their patrons. An aggregator offers a research library the opportunity to build a multi-publisher e-book collection on a single user experience platform, integrated with other aggregated research databases (scholarly journals, and the like). Aggregators are able to offer a variety of access models at affordable prices (single-user, three-user, unlimited simultaneous access, for example). Aggregators partner with established book wholesalers to make e-book purchasing a convenient part of the acquisition workflow. The role of an aggregator is to complement a publisher’s direct sales efforts – whether the publisher has their own platform or not. Libraries make their choice of where they desire to build their e-book collection – on an aggregated platform or on a combination of publisher and aggregator platforms. A publisher platform will often have functionality that is optimised to the publisher’s particular content type where an aggregator has the same functionality available across all e-books on the platform. Most librarians understand that publishers are at different places with respect to formats and DRM. Aggregators strive to offer whichever format or formats the publisher makes available and to accommodate the DRM requirements each publisher requires. Today, e-book subscriptions have grown in popularity but perpetual purchase continues to be the dominant model preferred by libraries. Patron-driven acquisition (PDA) and demand-driven acquisition (DDA) models are implemented in different ways across libraries that experiment with them. The role of DDA in the future is unclear at this point; there likely is a role for DDA in building e-book collections, but it may not look like the offerings available today.